Researchers from the Texas A&M report that watermelon has ingredients that can create natural “Viagra-like effects,” according to Science Daily. The star ingredient is called citruline, which, when consumed in large quantities, reacts with enzymes in the body to produce arginine. Arginine relaxes blood vessels throughout the body, which is a similar mechanism to how Viagra works, except that Viagra is organ-specific. Watermelon also contains lycopene and beta carotene, that work together with cirtuline, and also support healthy immune function. 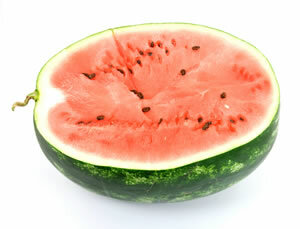 Citruline is found in the rind of the watermelon…the part that most people don’t eat, but should. This entry was posted on Thursday, July 3rd, 2008 at 6:24 pm and is filed under Latest Nutritional Research. You can follow any responses to this entry through the RSS 2.0 feed. You can leave a response, or trackback from your own site.